We have been observing the children very carefully these past few weeks to identify the schemas in action in our classroom in order to learn more about each child's personal learning process. Schemas are patterns of repeatable behaviour the children use to test out ideas and to make sense of the world around them. Once a schema is identified, it is very important to offer the child appropriate activities which will nurture the patterns allowing the develop and progress of learning. After a few weeks of careful observations, it emerged that a group of younger kids in particular shared the same schema called "positioning". 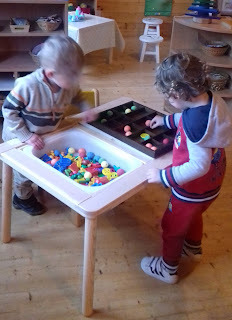 The children love lining up toys or placing objects in very specific ways . It does not necessarily follows the logical thinking process of an adult but it seems to make complete sense to their little minds. And I dare you to try to "reorganise" everything... Tantrums may follow, tears or screams of frustration. 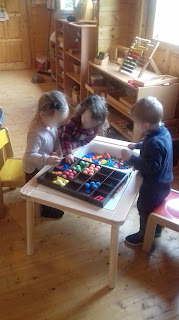 We have observed children positioning, ordering and arranging objects sometimes in very obsessive manners. They sometimes line them up in order of size, colour or shape or texture too. 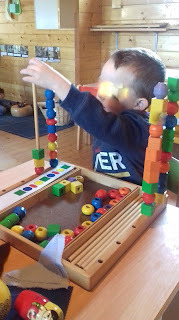 They also love "stacking" activities: cylinders, blocks, lego, cubes, animals on top of each other, books etc... Some of them also like their food to be placed in a certain way on their table mat and they can be very particular about it. Or they may not like if certain type of food is touching. Keeping this schema in mind, we had a look in our classroom to make sure the children had enough opportunities to play and learn . Below, are a few of the "Positioning" activities children are presented with or can choose from in our setting. These activities are usually loved by smaller children and though the materials themselves might have a more direct objective (such as counting and representing quantities or matching colours), we let the children in a "positioning" schema use them freely. They just enjoy placing the counters in a certain way. Later, as their learning expand, they will start using them in the way they are meant to. This game is supposed to help children learn about following patterns with colours and shapes. Many of them just love stacking the beads onto the rods, following their own design. Some children also like lining up the crayons. As simple as this. 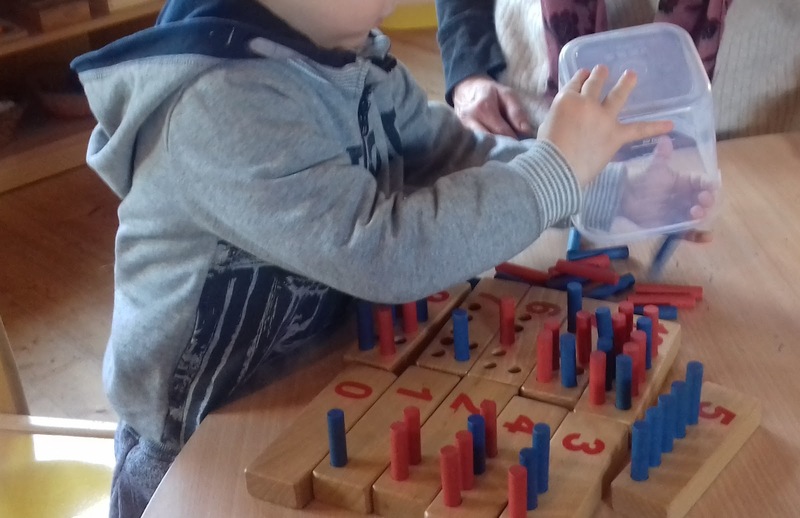 This is not the right way to use the Montessori Pink Tower but here again, you need to step back and recognise the child's schema and allow him to test his ideas. Observe the need for lines, order and association in the picture. 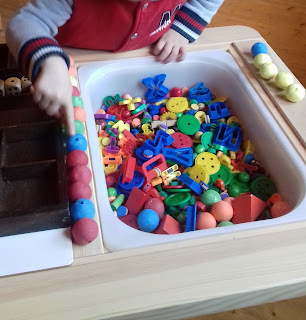 Our bear counters are a favourite. 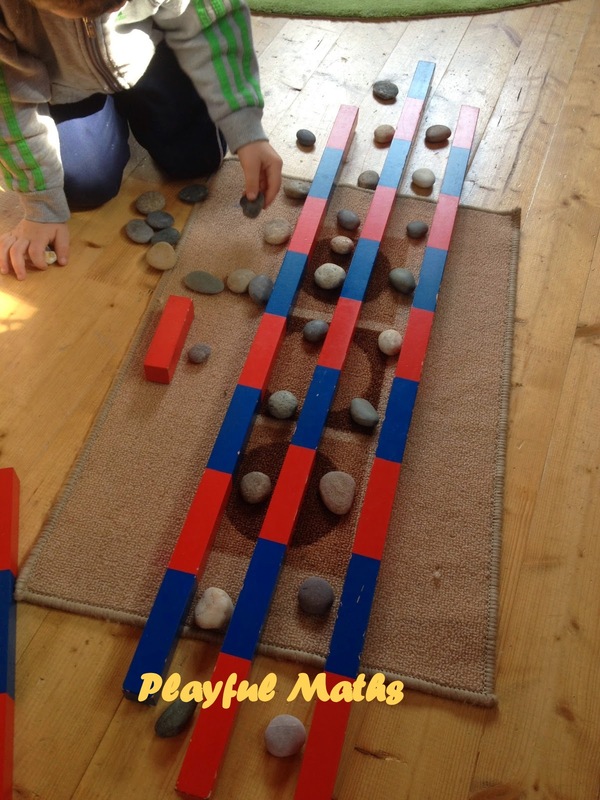 We use them with the wooden grid to associate numbers and quantities or to categorise them by size or colour. But children make their own rules, placing the bears in the way they like. The Montessori Brown stairs is often used by little ones in a "positioning" schema. Here, it has actually been used correctly but the little girl decided to use other material and is placing them on top of the stairs in a manner that allows her to problem-solve, question, predict, imagine, speculate and develop independent choices as she was making decisions in an area she was familiar with. Blocks can be lined up, stacked up. We have coloured blocks and natural colour blocks. Children use them to build anything. They sometimes choose to place them in a certain order that make sense to them, mixing them up with other blocks or other materials. 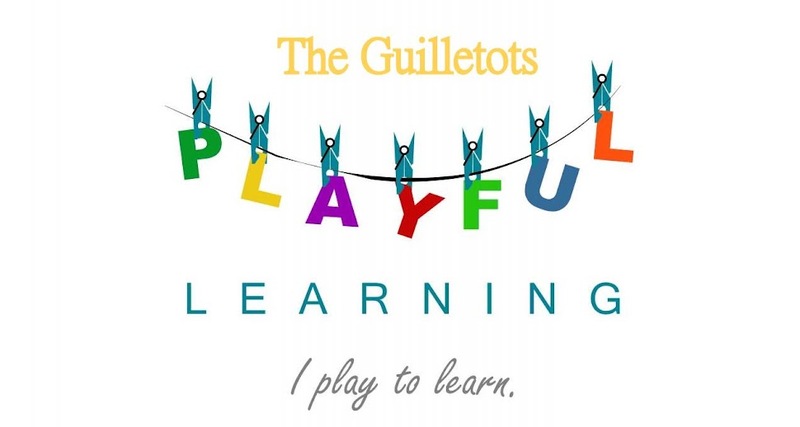 It may seem random to you but the fact is that children use that type of play to develop a methodical, systematic and logical collection of information through heir senses and their movement. What else do you do in your classroom to support the "Positioning" schema?